0xcert is proudly announcing a new milestone has been reached on our path towards decentralized future. 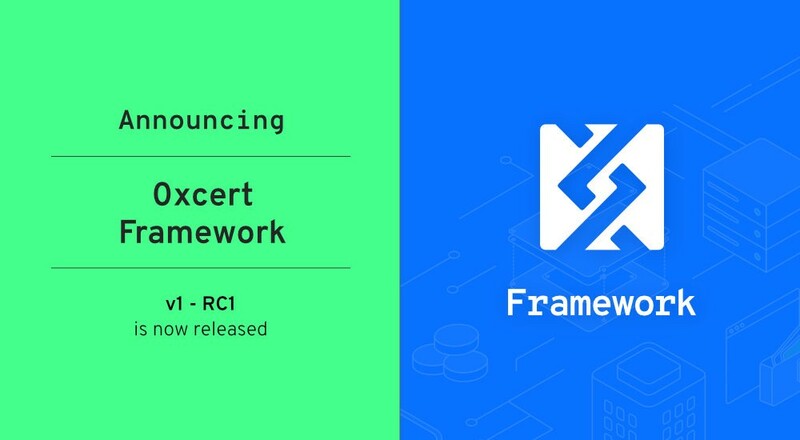 The 0xcert Framework v1-RC1 for developing decentralized apps has been officially released. After months of hard work, we have published the final result as an open-source framework available to anyone. You may find it on our newly opened GitHub repository or explore its applications and usage in the documentation guidelines. Our CEO Kristijan Sedlak has announced the Framework’s arrival last week in Miami, to the audience of the North American Bitcoin Conference. The aim of the 0xcert Framework is to support the developer community engaged in developing decentralized apps (dapps). So far, development of dapps took required large and experienced teams working full time for months, and still, the quality of the end result was not guaranteed. The 0xcert Framework narrow down the whole complexity of developing a dapp to just a few lines of code. This way, the professionals assigned with the task of developing a dapp do not need to have a whole range of extensive experience. Instead, the knowledge of building a website is quite enough. The complexity of blockchain tech is indeed evolving on a daily basis, but it’s not too late yet to start learning about it and leveraging it. With the 0xcert Framework, you can build a dapp even if you’re just starting exploring the blockchain tech. We can think of the 0xcert Framework as a funnel that untangles the complex way of building a dapp and filters it down to just a few lines of code. Here is what the difference when applying the 0xcert Framework looks like. Obviously, shorter development time means significant reductions to the needed personnel and the dedicated budget). What’s more, you can actually rely on the final outcome, as the Framework follows strict standards and conventions. creation (minting), management, and verification of ERC-721 non-fungible tokens (assets) — it allows you to tokenize and trade your unique asset on the blockchain. management of ERC-20 fungible tokens (currencies) — you can assign a financial value in fungible tokens to your non-fungible asset. many-to-many atomic operations — you can create and transfer multiple tokens (both fungible and non-fungible) on the blockchain in one single transaction. conventions for interoperability between different applications — you can work with many applications in the same way without the need to adapt to different systems. For easy navigation through the features of the 0xcert Framework, please refer to the complete guide for building a decentralized app here. Based on the level of your knowledge and the stage of development of your dapp, you can move through sections in the menu. The 0xcert Framework allows you to create and manage your unique assets on the blockchain — be it collectibles, certificates, tickets or coupons. You can even build a decentralized exchange for trading them. The current version of the Framework is built for developing dapps on the Ethereum blockchain. Soon, we will add operability for other systems, too, in line with our blockchain-agnostic commitment. We believe it is crucial for the Framework to be published as an open-source product, and we’ll continue supporting the developer community with new products and upgrades. If you find the 0xcert Framework useful, we’d love to see your support — click the ⭐️ and the 👁️ icons on top of the GitHub repository. Or, just spread the word among your dev friends and let us know how the Framework worked out for you. We also welcome anyone to join our newly opened Gitter channel and to talk with our devs.